Enjoy a luxury stay in the Factors Suite which features furniture crafted from reclaimed timber and works by contemporary Scottish artists. This busy harbour is home to the region's RNLI Lifeboat crew and the town itself hosts many related events and activities throughout the year. 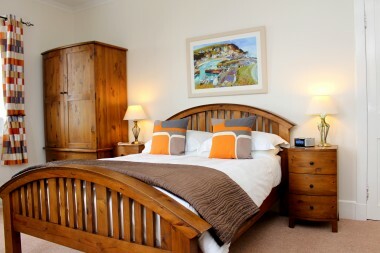 Rickwood has six stylish bedrooms, all individually decorated to a high standard. 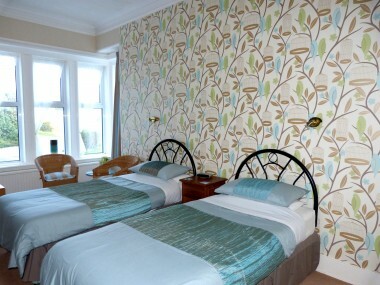 All our rooms are en-suite and several have stunning sea views. 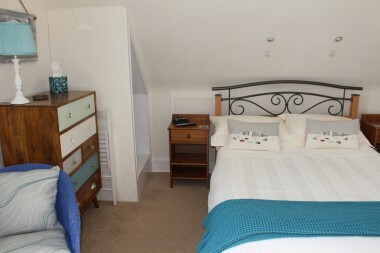 Our bedrooms are fully equipped with TV/ DVD, Radio Alarm Clock, Hairdryer & hospitality trays with a variety of teas, coffees, hot chocolate and home made shortbread. En-suites have toiletries by Scottish Fine Soaps. Our master bedroom – the “Factors Suite” is a spacious room, featuring furniture crafted from reclaimed timber and prints by contemporary Scottish artists. The suite has not one sea view but two. There are windows to the south and to the west – even the large en-suite has a view! The Factor`s Suite has a comfortable seating area where you can relax and enjoy the view. To add that bit of extra luxury, we provide fresh flowers and toweling bathrobes – just the room for that special treat. The large en-suite has a bath with a shower. Our Factor`s Suite doubles as a family room as we can add a further one or two single beds. 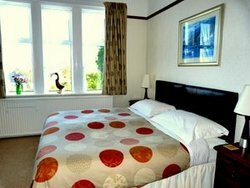 This is a spacious ground floor room, furnished to the same standard as our Factor’s Suite. Room 1 has a bath with shower, sea views and can either be super king-size or twin. 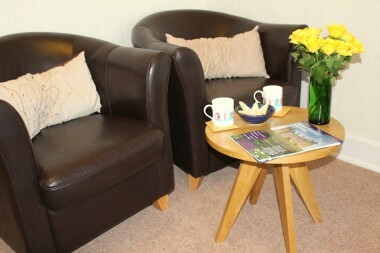 The room has a seating area with two leather armchairs. 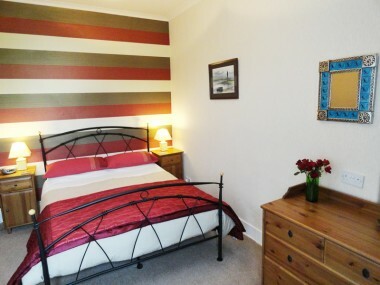 This is a bright, recently refurbished room with a standard size double bed. 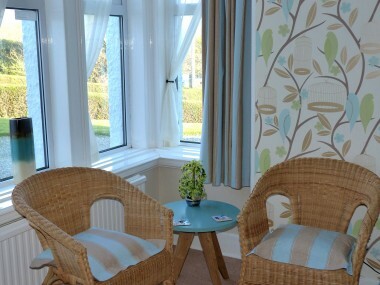 There are two leather arm chairs by the window and our generously-sized en-suite has a walk-in shower. 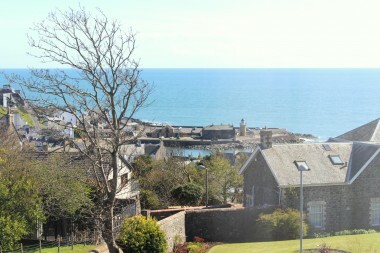 This upstairs room faces south and has a view over Portpatrick village to the Irish Sea. It has a standard double bed and the en-suite has a bath and shower. 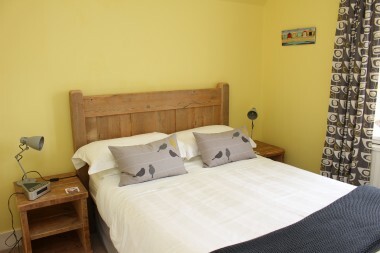 While Room 5 may be slightly smaller than our other rooms it has all you require for a few nights stay. 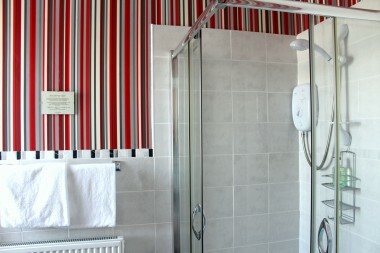 There is an en-suite with a shower and the room, which faces west, has a view over the Irish Sea. On clear nights, you can see the lights of the Northern Ireland coast twinkling in the distance. This spacious ground floor room has a seating area by the window. The en-suite has a walk-in shower. All rates are per person per night. Prices are for guidance only and subject to seasonal variance. Please email, check on-line, or phone us in 01776 810270 for applicable prices. Single occupancy – please contact us. All our en-suites at Rickwood House Portpatrick have high quality Sea Kelp fragranced toiletries from Scottish Fine Soaps. You can check our availability and book here. At peak periods a minimum stay of 3 nights may apply but please check anyway. If you would like to stay for one or two nights we may still have availability so please contact us by phone, email or by using the enquiry form and we will get back to you as soon as we can. A reservation for accommodation made either by letter, telephone or e-mail, is a legally-binding contract between the guest(s) and the Firm of Rickwood Hotel. To secure a booking for accommodation, guests are asked (wherever practical) to provide their debit or credit card details. We will hold this as security but will not debit the card with a deposit fee. In the event that a cancellation of accommodation becomes necessary and if 10 or less clear working days notice is given then the full amount of the booking will become payable. For cancellations where more than 10 days notice is given then the price of the first night’s accommodation will be payable. If guests fail to arrive without notification, the full amount of the booking becomes payable. We will make every effort to rebook the room and, if successful, then any payments received by us from re-letting will be offset against the original amount of the booking. YOU MAY WISH TO CONSIDER TAKING OUT TRAVEL INSURANCE TO COVER FOR THIS EVENTUALITY.